Sometimes your program uses a lot of system time. Let's say 90%. 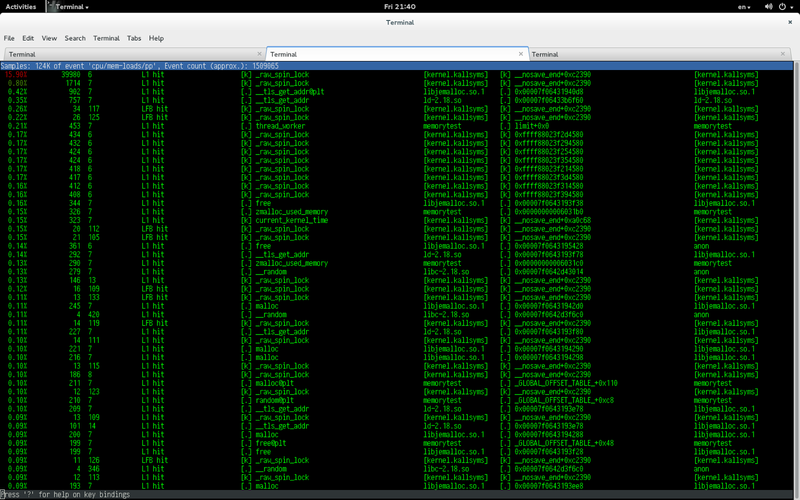 You fire up your favorite profiling tool and it tells you which system call it is. If you are experiences and maybe lucky, you can say straight away which part of your program is to blame. But it's not always so obvious. GDB comes to the rescue. You can use 'catch syscall <syscall>' and it will break when particular syscall is called. And then you can use 'bt' to find where in your code this syscall is being called from. P.S. Don't use random() in multi-threaded program. Use random_r(). I have being playing today with perf on latest available kernel in Fedora (3.13). These are just some observations and thoughts. This tool is similar to strace, but almost without overhead. Contrary to strace, you can use perf trace to watch syscalls system wide or system calls generated by processes owned by certain user. Function names are shown correctly and -g parameter is now available. 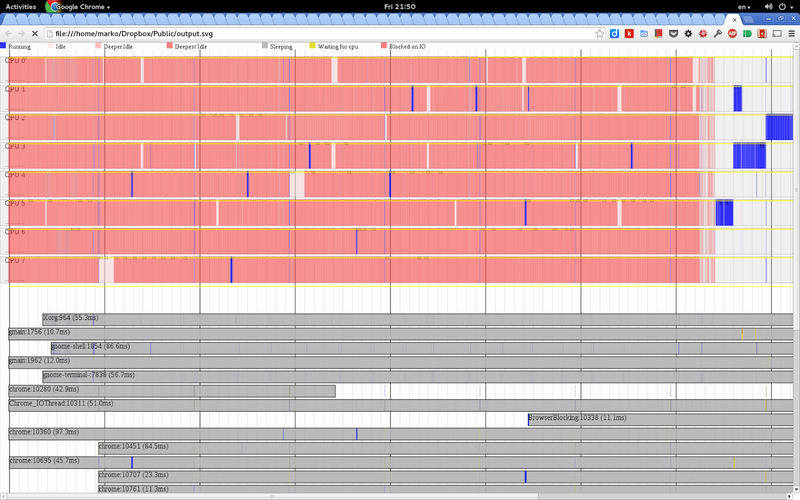 It means that you can get call traces in a real time (without perf record). This tool creates cool looking diagrams of a system workload. This tool shows you very verbose system scheduler statistics. Including latencies for a particular process. You can see if your server wasn't available because of scheduler. I don't know what for, but perf sched can replay previously recorded system load. Maybe it is useful for scheduler development and optimization. This tool collects memory requests. It can show you whether your memory request was served by CPU cashe or not for example. tracepoint lock:lock_acquire is not enabled. Are CONFIG_LOCKDEP and CONFIG_LOCK_STAT enabled?